Will H. Lyons Tournament Staunton Chessmen. 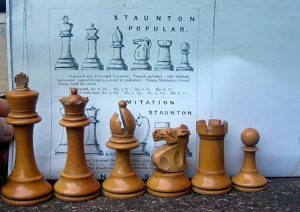 Offered here is a set of Vintage Will H. Lyons Tournament Staunton Chessmen. They are listed as size No. 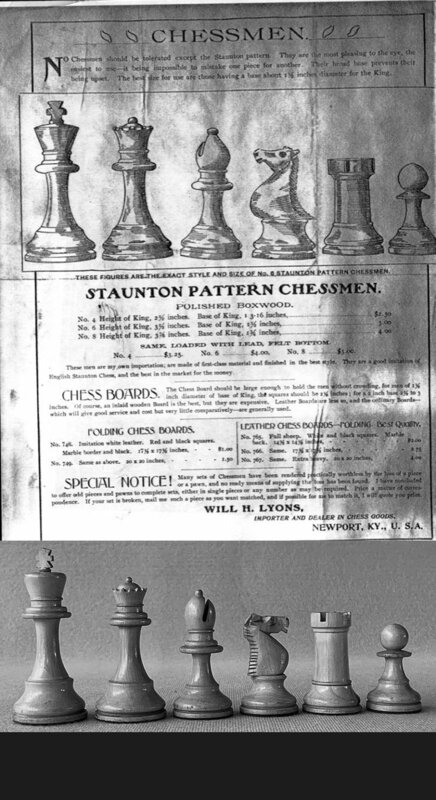 6 Chessmen in the Lyons’ advertisement. 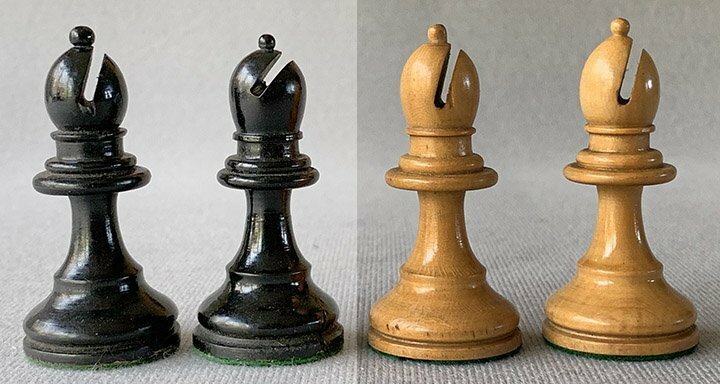 These vintage chessmen are Polished natural and black stained Boxwood. 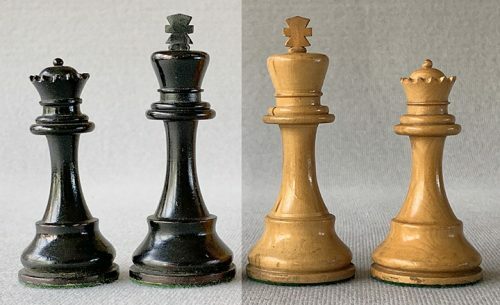 The chessmen are lightly weighted. All the chessmen still have their original green baize base pads. The King stands 3.4″ tall with a 1.5″ diameter base. This is a full tournament-size chess set. The Knights are rather crudely carved to reduce cost, but unlike competing chessmen, the Rooks are stout and properly sized to reflect their power on the chessboard. 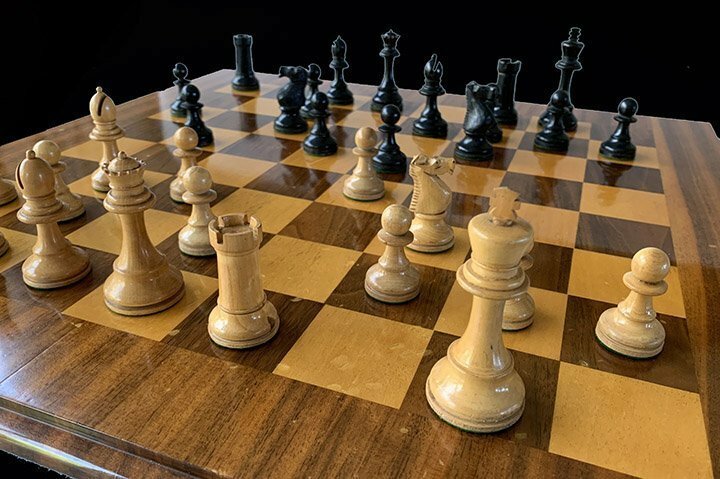 William Henry Lyons (1849-1932), of Newport Kentucky, was the world’s foremost chess literature dealer for around 30 years at the end of the 19th century and the beginning of the 20th century. He started his business in 1884. 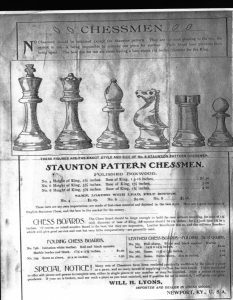 Lyons wrote a treatise on chess problems; Chess-nut burrs: how they are formed and how to open them, which he published in Newport in 1886. 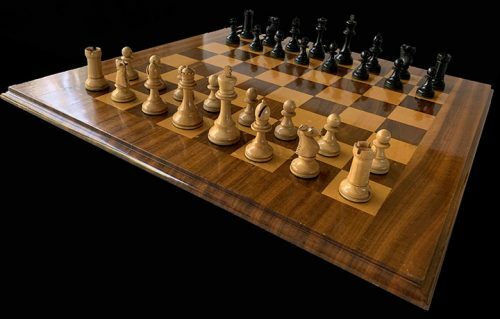 His advertisements can be found in such publications as The Chess World, Volume 1-5, from 1893, among others.